Mail servers send and receive email messages on the Internet. MX (Mail Exchanger) records specify and prioritize the incoming mail servers that receive email messages sent to your domain name. There is often no need to modify your MX records. Sometimes you have to update them if you host a website with one network (such as ours) but you have email hosted in another. For more information, see What is an MX record?. Warning: You cannot set up your domain name to use more than one mail provider at a time. If you have an email account through another email provider and change your MX record to point to our mail servers, you'll lose access to your original email account. 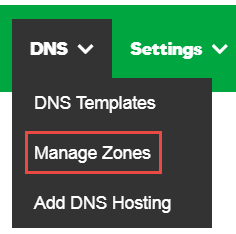 On the DNS Management page, at the bottom of the Records section, click Add and select MX from the menu. Host - Enter the domain name or subdomain for the MX record. For example, type @ to map the record directly to your domain name, or enter the subdomain of your host name, such as www or ftp. Points to - Enter the mail server's address, such as smtp.secureserver.net. Priority - Enter, or select the priority you want to assign to the mail server. TTL - Select how long the server should cache the information.